I have always wanted to do a sweet obstacle course type race such as this one but to be perfectly honest I am NOT a fan of running so this race is perfect for me because it's only a 5K and it's in an inflatable heaven. Just for being a reader, you can get a discount for the race! 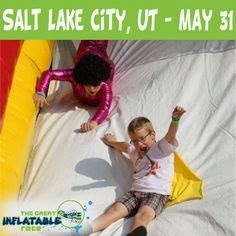 If you are interested in a $5.00 discount on the race, leave a comment below and let me know that you are interested and that you already liked The Great Inflatable Race on Facebook OR that you followed them on Twitter. The $5 discount will be valid until the race. 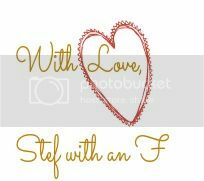 If you are interested in getting $10.00 off of the race, comment on this post and share this post from Stef With An F's facebook page on to your own facebook news feed to spread the word about the discount and I will send you the code to get $10.00 off! THE $10 DISCOUNT WILL ONLY LAST 3 DAYS SO MAKE SURE THAT YOU TAKE ADVANTAGE NOW! 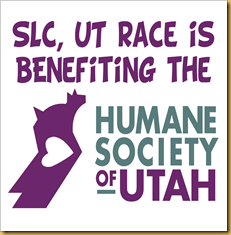 To top it all off, each race benefits a local charity and this year the race will be benefiting the Humane Society of Utah. Just another reason to come out and join me in the fun :) May couldn't be here fast enough, not just for the race, but for the start of summer, the warm sun sounds so good right now. And to play in the warm sun sounds even better. Oh my gosh! I need to do this! Like for reals. I think I am going to sign up for this! I am so glad we met at BYBC. You are adorable!